Trade Association for Information Technology (TAIT) hosted an insightful session for its members on the dynamic world of digital marketing and how it can harnessed effectively by members to grow and expand their business. With the rising insecurity of the ever expanding online portals, who have seemingly offering direct competition to the IT retailers and distributors, the fear of ‘Digital’ as a medium has created quite a scare among these conventional businesses owners. While these business challenges are real, one cannot deny the fast expanding digital-first ecosystem that has nearly taken over every aspect of modern human lifestyle – from education, banking and finance, business, healthcare and wellness to entertainment, travel and hospitality, it is high time one faces the fears, armed with hard facts and learn key adoption techniques. 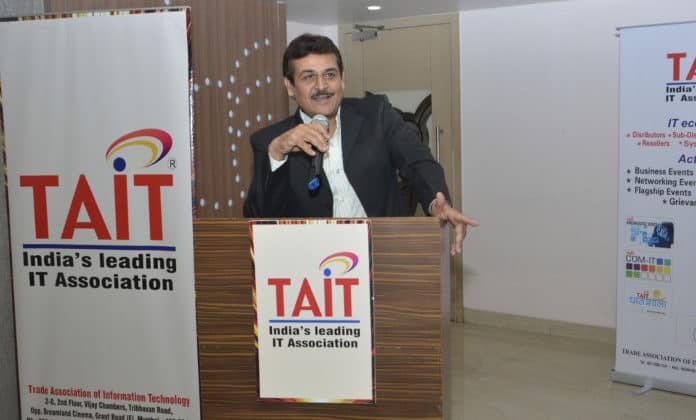 In line with the above objective, TAIT hosted Manoj Kotak, a renowned digital marketing expert, who has conducted more than 65 sessions on digital marketing for over 3,750 attendees across India. In addition to facilitating technology adoption for masses, Kotak has also represented the Indian IT Industry across 17 countries covering the US, Latin America, Europe, Asian countries and Saudi, as a member of a delegation of India’s largest electronics and IT trade facilitation organisation that boasts of a consolidated export performance of US$ 200 million by all its members. Viren Bavishi, General Secretary, TAIT, introduced Kotak to the members and laid the foundation to the conversation, laying the background of key concerns and fears of the members, the answers to which they were seeking from an expert. Kotak further highlighted how digital is just a new platform for doing business, and took them through the step-by-step process leading to complete transformation of PUSH to Digital Marketing. He further highlighted the how the traditional way of marketing has eventually converted to digital marketing and how the invent of the mobile revolution has added to the digitisation. Fears regarding business competition, virtual business presence and its consequences and how to adopt and grow professionally in a digital first world, were some of the key concerns that plagued the members present for the session. Kotak also took members through the nuances of social media management through Google and Facebook advertisement and how these could be leveraged to reach a specified set of target audience, at fraction of traditional marketing cost. Speaking to the members at the end of the session, Sameer Parekh, President, TAIT said, “The digital space and the existing players, giants like Amazon and Flipkart, had been a cause of worry for most IT retailers and dealers, with most members being apprehensive about the future in the digital world. “Through this session, we hoped to offer members a holistic, factual view of the situation and to equip them with the necessary knowledge to not just survive the online competition but to also thrive in it. We are happy to have hosted Kotak for this session and are grateful for his insightful session that has helped all members – from bigger traders and retailers to smaller business owners, System Integrators and traders, who are now equipped with knowledge and confidence to utilise Digital Marketing Weapons at minimal cost and expand their business” he further added. TAIT hosts digital marketing expert Manoj Kotak for a session on ‘Digital First World’ 0 out of 5 based on 0 ratings. 0 user reviews.